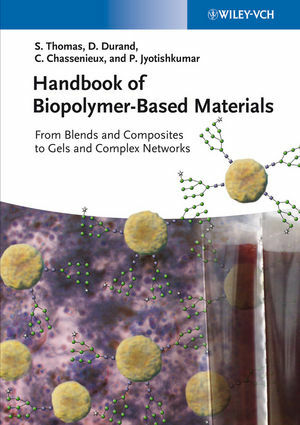 This first systematic scientific reference in the area of micro- and nanostructured biopolymer systems discusses in two volumes the morphology, structure, dynamics, properties and applications of all important biopolymers, as well as their blends, composites, interpenetrating networks and gels. the synthetic routes to the generation of both micro- and nano-morphologies, as well as the synthesis, characterization and application of porous biopolymers. An outstanding resource for anyone involved in the fi eld of eco-friendly biomaterials for advanced technologies. alloys, and polymer recycling, has an h-index of 57 and has edited 23 books. Professor Thomas is also a Fellow of the Royal Society of Chemistry and a Fellow of the New York Academy of Sciences. His work has been awarded with the Professor Sukumar Maithy Award, the Bronze Medal of the Chemical Research Society of India (CRSI) and the Materials Research Society of India (MRSI) award, among others. Dominique Durand is a Research Director Emeritus at the CNRS and former Director of the Polymers, Colloids and Interfaces Laboratory at the University of Maine, Le Mans (France). His research focuses on experimental studies and modeling of static and dynamic properties of complex systems, such as covalent networks, associating polymers and biopolymer gels. He is the author or co-author of over 210 research papers, reviews, and book chapters. Christophe Chassenieux is a Professor at the University of Maine, Le Mans (France) since 2005, after being an Assistant Professor at the University Pierre et Marie Curie, Paris. His research interests encompass properties of polymer gels and self-assemblies of amphiphilic polymers. He is the co-author of 50 research articles, book chapters and patents. Parameswaranpillai Jyotishkumar is DST INSPIRE Faculty at the Department of Polymer Science and Rubber Technology, Kerala (India). He has completed his PhD from Mahatma Gandhi University, Kottayam. Dr. Jyotishkumar's research focuses on polymer blends, nanocomposites, and bio-nanocomposites. He is the author or co-author of 30 research articles and book chapters.